This is a report of a visit to Ishinomaki city in Miyagi prefecture for 3 days from 7th to 9th August, including a visit to Ishinomaki Hibi Newspapers who showed us the handwritten newspapers which were published immediately after the disaster, for an event in March this year held at the National Guimet Museum in Paris. From Mito city in Ibaraki prefecture, we joined the Jōban Expressway and drove up to north. From Iwaki, we had to take a detour as a part of highway was closed in Fukushima prefecture where a nuclear power plant was affected by the tsunami. We then finally joined local road at Sendai city in Miyagi prefecture. 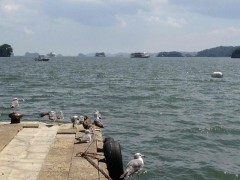 As we carried on our journey, the sea of Miyagi appeared in front of us. There were some shops along the coastline of the Pacific Ocean and no trace of the disaster could be found. Apparently this area had escaped the full wrath of the tsunami as the small islands nearby obstructed it. There was a sense of relief on seeing these shops busy with tourists. We drove through Higashi Matsuyama and carried on to Ishinomaki. The road we were on was well maintained and we even saw a large supermarket and a Japanese pinball parlor along the road. It was hard to believe we were in the “affected area”. Another noticeable thing was the amount of open fields. On arrival at Hibi Newspapers we opened the front door whilst glancing at some tourists taking pictures of this famous company. 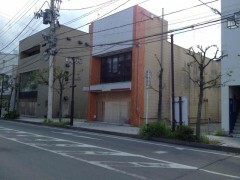 Ishinomaki city lost a substantial number of households as a result of the disaster, hence the company lost the most of its readership. However, what we witnessed was a lively office which looked busier than ever. The ground floor, which was damaged by the tsunami, had been restored and the newly installed printers were working non-stop. From the second floor we looked over the back yard where the tsunami was said to have poured in. Both Mr Omi, president of Hibi Newspapers and Ms Hirai, the press director, told us about that unforgettable day, even with smiles from time to time. It looks as if calm has returned, that everything is back to normal. I did, however, come to understand that the dreadful memory of the event is indelibly carved in people’s hearts. I felt that it was purely down to each one of the victims’ strong will to help their town’s recovery and move forward that brought them where they were today. Mr Akiyama of Hibi Newspapers showed us around Ishinomaki city. After the half day trip I was absolutely stunned to have found out that those endless open fields I saw earlier used to be a residential area. 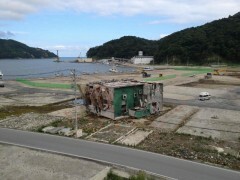 Thousands upon thousands of households were obliterated by tsunami. Weeds have started to grow on the mineral-rich empty fields which were created by the inundation of the sea water as a consequence of the tsunami. The few surviving buildings serve as ghostly reminders of what once was. The shopping area in the city centre was more or less empty; few shops were open and some closed shops remain without ceiling or walls. Why they were left in such state? 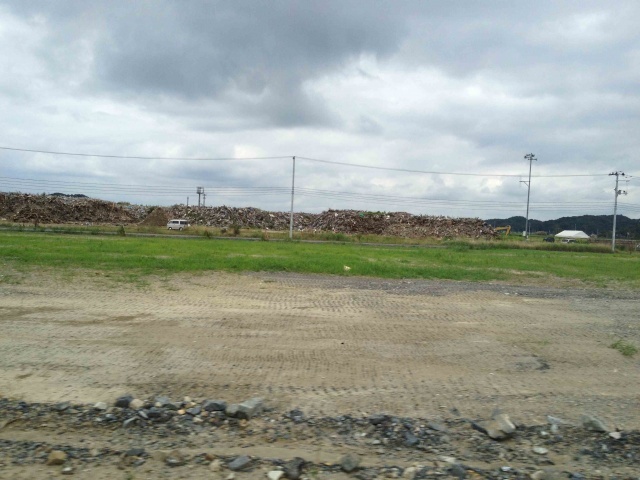 I soon found out: there is a plan to build new dyke along the Kitagami river which runs near the city centre. In order to build it high enough to contain a tsunami, there is a possibility that most of the city centre may have to become a part of dyke. Some shop owners left their part-demolished shops as they were. On the other hand, the plan to build the new dyke has been put on hold since there have been mixed opinions over this huge dyke which will obscure the view from the city. The next day, Ms Hirai showed us around an area which is not normally visited. It took a while to get there by car from the centre. There was nothing other than a pile of rubble and working vehicles. The area was so deserted that is unimaginable that it used to be a residential area. We went a bit further and there we found a beautiful beach with a few people just walking around the rocky area. Opposite this beach many trees were lying flat, having been uprooted by the tsunami. Next to these trees was a part of the wall which was survived the tsunami. 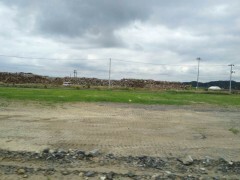 No new homes will be built in the open fields which used to be a residential area. Where will all the erstwhile residents be relocated? What are they going to do? 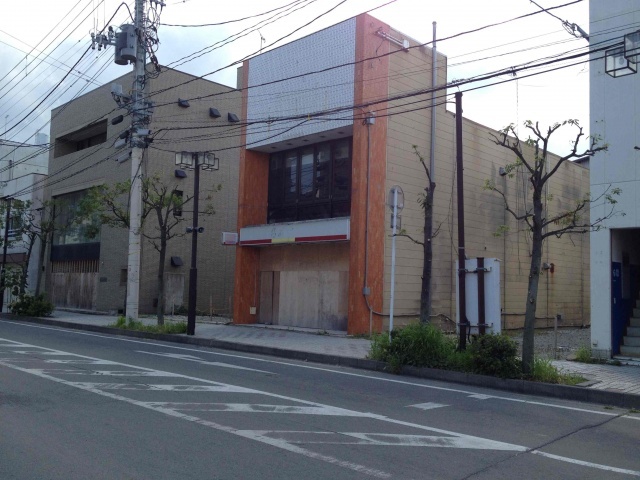 According to Mr Akiyama, a journalist who lost his own home, some have moved into temporary accommodation, some into rented accommodation and some built new homes elsewhere. The latter is no easy matter since areas where new buildings are permitted are limited and land on the hill shot up in price. There are people who still have to pay off the mortgage on their lost homes; some are struggling with a further new mortgage. Rental fees will be waived for a certain period but in reality all rented accommodation is now occupied. The government will buy land and prohibit the building of new residential homes. However, the value of the land has diminished so much that the government payments wouldn’t even be enough for a deposit to buy a new home. Mr Akiyama took us to some temporary accommodation sites, all away from the city centre. Most of the victims own cars, having received some condolence money from the government, so they have no problem getting about. Having seen the actual sites, feelings of sympathy towards these people grew. The buildings are very bland and there is no bustle of normal life; they are somewhat reminiscent of prison camp. The residents were supposed to only stay temporarily but the reality is that people don’t have anywhere else to go, even after a year. I could have got out of the car to lave a look around but I thought better of it and decided to observe from the car seat in order to respect their living area. As the car was driving up a hill, Mr Akiyama asked us to pay attention the view. A part of Onagawa town which was not affected by the tsunami was visible. After a while, the car went down the hill and there was the sea in front of us. Along the entire coastline lorries and cranes were there engaged in pavement construction. There was nothing to be seen but remains of three reinforced concrete buildings and endless open fields. Mr Akiyama pointed out that this area had been full of houses, similar to the view from the hilltop. We were absolutely speechless. There was no trace whatsoever to tell us of a once thriving community there. The car took me to the top of another hill. I looked down from a hospital car park to an empty space where there had once been a town. The tsunami almost reached this car park, we were told. Imagining that huge wall of water pouring in made me shiver. I took some pictures, not because I wanted to, but for the records. 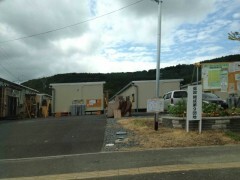 The temporary accommodation here in Onagawa town is also set in a mountain area, isolated from it all. During this visit, I was able to talk with and listen to the stories of people who worked at Hibi Newspapers, NPO workers, support workers or children, people who were involved in disposing of bodies. The word “bonded” has been used often since the disaster but I was not sure exactly what to do to maintain this bond. After talking to these people, the meaning of this bonding had gradually become clearer. Ishinomaki has always been a peaceful, rural town. There haven’t been any international exchange activities. Since the disaster, they needed help from outside and as they accepted that help from other prefectures and even from abroad. Some volunteers have even relocated to live in this area while offering help. As it happens, with this help, the survivors have determined to move forward to rebuild their town with more resolve than ever. The children in the area were willing to be a part of the rebuilding project and to contribute whatever they can. 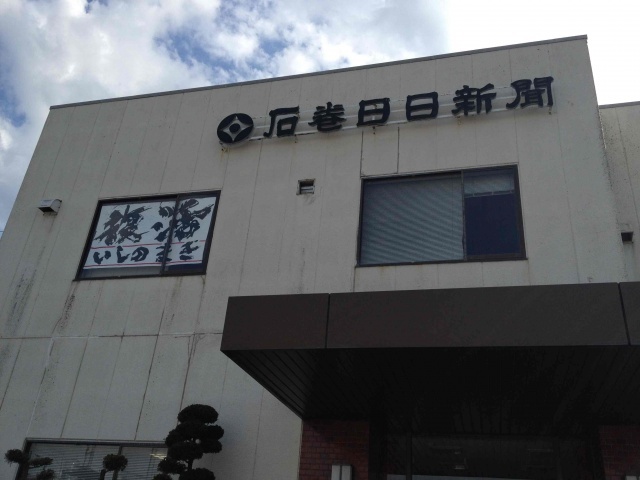 What Ishinomaki needs for the future is to maintain their local industry while being supported internationally. Ishinomaki needs the international bonding it currently has for the long term. 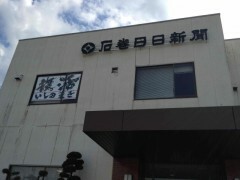 For my part, what I can do is to tell the world what Ishinomaki needs to develop and support their industry as well as how beautiful Ishinomaki is to visit. Also to pass on updates from this area every so often and to remind people about Ishinomaki. “Bonding” is not always visible to us yet I feel it is important to make it visible sometimes to revitalise the connection. Last, but not least, I want to take this opportunity to thank Mr Omi, Ms Hirai, Mr Takeuchi, Mr Akiyama and all the other staff at Ishinomaki Hibi newspapers; Mr Nobu, Ms Ota at Kids Media Station; Ms Kaneko and all the other staff at Ishinomaki Fukkou Net; and all the other people who took time to meet and talk to me.